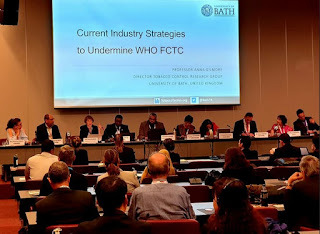 Governments of 181 countries and the European Union met in Geneva for the 8th conference of the parties to the global tobacco treaty, formally called the World Health Organization Framework Convention on Tobacco Control (FCTC). The tobacco industry has a history of using legal threats to intimidate governments into abandoning the implementation of the treaty’s boldest measures but some still hope the burden of tobacco can be shifted onto the industry. Article 19 of the treaty gives governments the power to use the law to hold the tobacco industry legally and financially accountable for the harm it causes. “For too long the tobacco industry has used legal threats to intimidate governments into abandoning the implementation of the treaty’s boldest measures. It is time to shift the burden of tobacco onto the industry, force it to respect the rule of law, and make it pay for the harm caused by its products” said Michél Legendre, Associate Campaign Director, Corporate Accountability. Over the last 12 months, the industry has doubled down on promoting heat-not-burn products and launched a billion dollar foundation in the hope of regaining a lost footing in policymaking spaces. “Every year tobacco kills more than seven million people globally, making it the largest preventable cause of death on the planet. The tobacco epidemic costs the global economy more than US$1.4 trillion each year. Holding the industry liable for its abuses could recover money and resources governments need to reverse the tobacco epidemic. Not only that, these types of settlements in the past – like the Master Settlement in the U.S. – have uncovered millions of internal industry documents that discredit the industry, limiting the negative impact they can have in the future” added Legendre. Tobacco is the only legal product that causes the death of half of its regular users. This means that out of 1.3 billion smokers, 650 million people will die prematurely, says the WHO. The global tobacco treaty went into force in 2005. To date, 181 countries and the European Union have become Parties the treaty, which contains the world’s most effective tobacco control and corporate accountability measures—estimated to save more than 200 million lives by 2050 when fully implemented. The treaty provides legal, academic and financial resources to governments to help them force accountability on the industry.